As summer transitions to fall, it becomes time for warm apple cider, flannel shirts, and of course, fall foliage. If you want to see the luscious leaves change from green to bright golds, oranges, and reds, view fall foliage from September to October. The United States is rich in fall splendor, though you can see the foliage throughout the world. You can take a hike, go camping, or take a scenic drive. Don’t forget your binoculars and camera! Search online for fall foliage destinations. 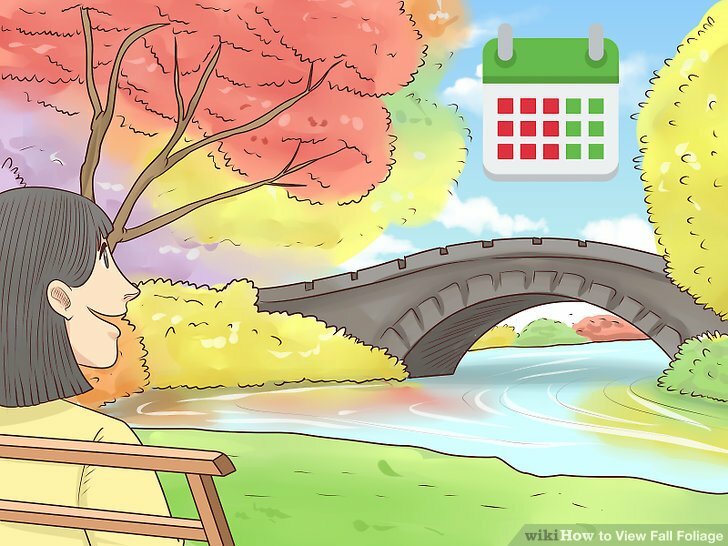 If you are unsure of where to go to look at the fall foliage, search for “best foliage viewing spots near me” or “fall foliage destinations” online. Then, browse regional or national fall foliage hot spots. Travel to local state and national parks to see fall foliage close to home. 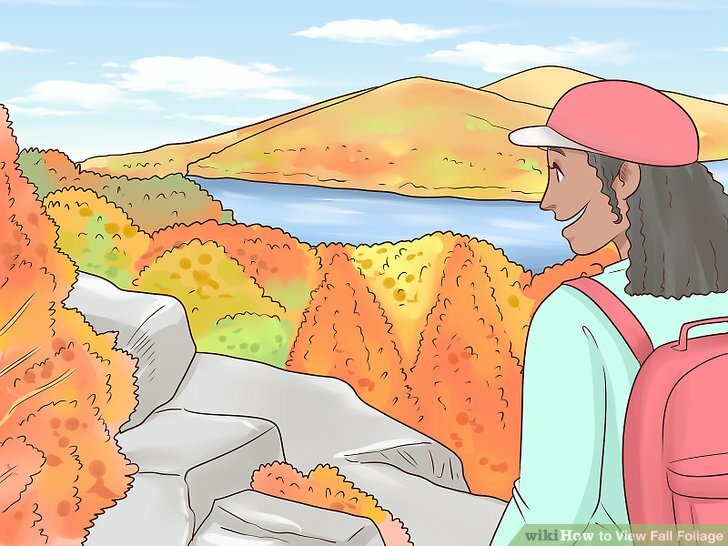 You can see great foliage in U.S. states like New Hampshire, New York, Maryland, Massachusetts, Georgia, Arkansas, and Oregon. Choose a local park if you want to stay close to home. Travel 20 minutes to 2 hours, for instance. Decide on a fall foliage vacation if you want to visit the hot spots. If you are a fall foliage enthusiast, consider traveling to the best view spots in the country, such as the Columbia River Gorge, the Cats****s, or the Ozarks. After you search online for destinations, choose your favorites. Then, either drive, fly, or take a train. You can book your hotel in advance, or consider going camping instead! Other gorgeous destinations are parks throughout New England and the Appalachian Trail. Visit a variety of locations to see a diversity of fall foliage. Throughout the fall, visit several different spots if you want to take advantage of the autumn colors! Travel to all of the parks nearby, and consider taking a small road trip 1-4 hours away to see other hot spots. This is a great way to see a wide variety of foliage opportunities. For example, if you live near Washington, D.C., you can visit parks in Maryland and Virginia. Also consider driving to North Carolina to see the trees of the Blue Ridge Mountains. View foliage near rivers, waterfalls, or lakes for a gorgeous backdrop. While searching for local or regional parks, consider visiting those with sources of water nearby. 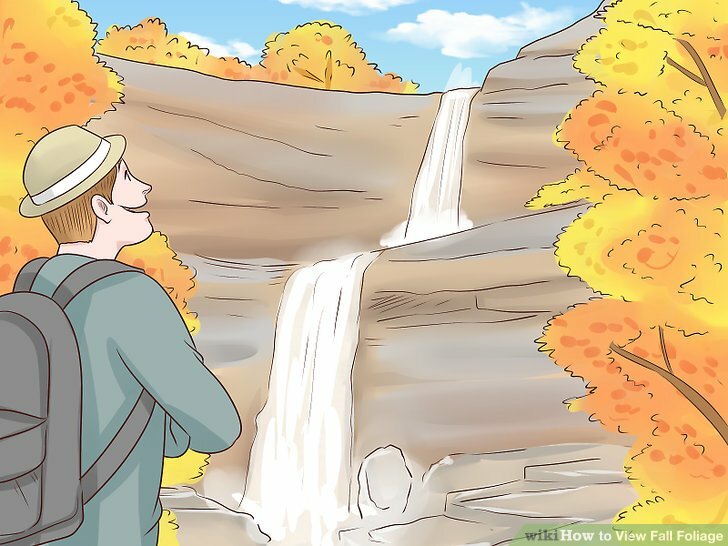 Features such as waterfalls or streams look particularly lovely when paired with fall foliage. The water adds a refreshing touch, and the colors often stand out even more. You can search particularly for foliage spots near water, or you can ask a ranger for a recommendation. For example, you can visit the Amicalola Falls State Park in Georgia or Lake Ann in Washington. View foliage from September to October. The leaves begin to change colors throughout September. By the end of October, they are usually very bright in color and ready to drop from the trees. 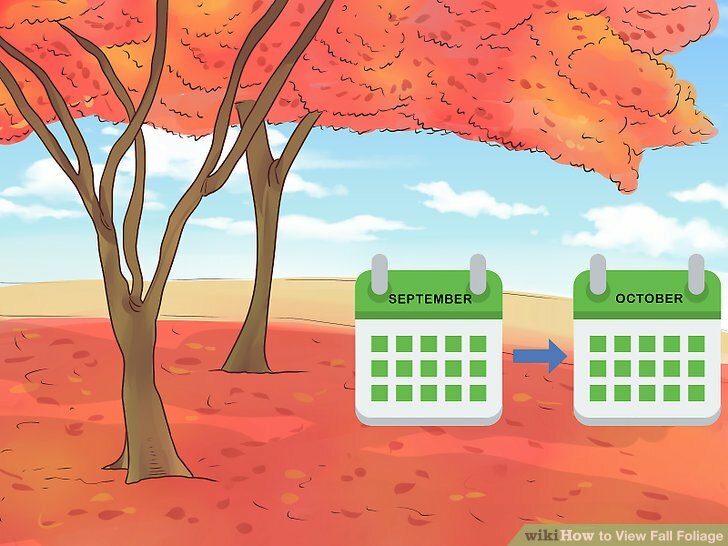 Search online to determine the very best timeframe for foliage viewing in your area. For example, foliage in southern states like Georgia may peak earlier in September, while northern states like Pennsylvania see their peak foliage in mid-October. Ask local experts or forest rangers about peak viewing times. 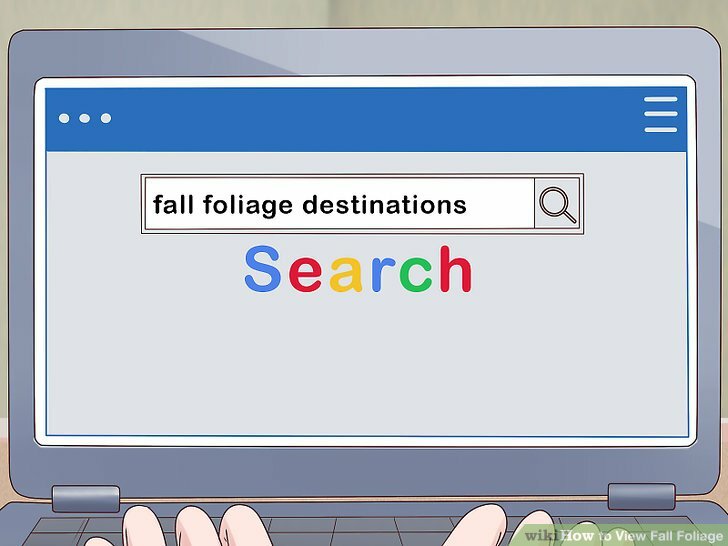 In addition to searching online, you can also visit a nearby park and ask the park ranger when the best local foliage viewing is. 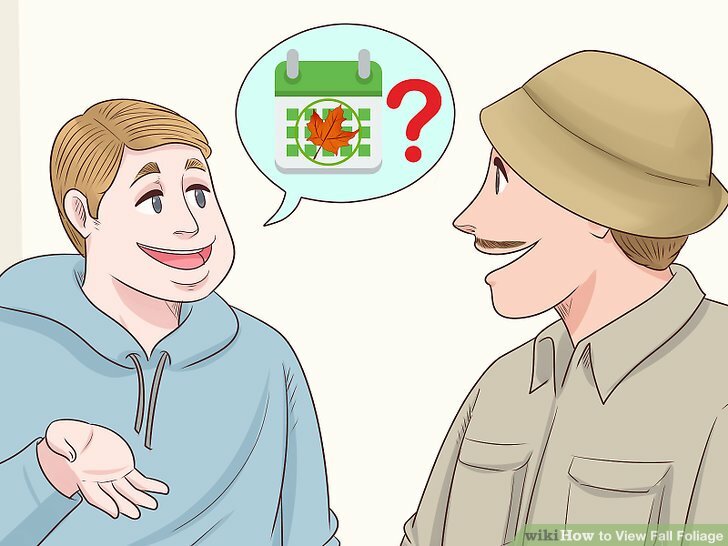 The park rangers are professionals, and they often have great tips and tricks about where to see the most colorful displays. Visit parks on the weekdays if you want to avoid the crowd. While many people think of weekend getaways when they picture fall foliage, this is the busiest time to see the colorful leaves. If you want to view the leaves without large crowds, try to visit during the week instead. Many parks are open until sunset, so you can go even after work! 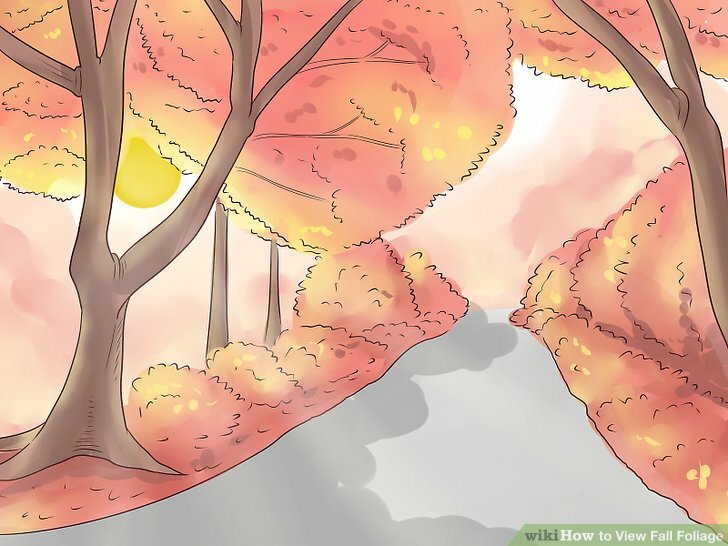 View the foliage during the sunrise or sunset for a splendid sight. The fall colors look lovely at all times of the day; however, a particularly stunning sight occurs when the sun is rising and setting each day. View the foliage around 6:00 am or 6:00 pm if you want to enjoy Mother Nature in all her glory. The blue, pink, orange, and yellow tones of the sunrise or sunset look incredible with the fall foliage. This is a great photo opportunity as well. Go for a scenic drive on an autumn day. 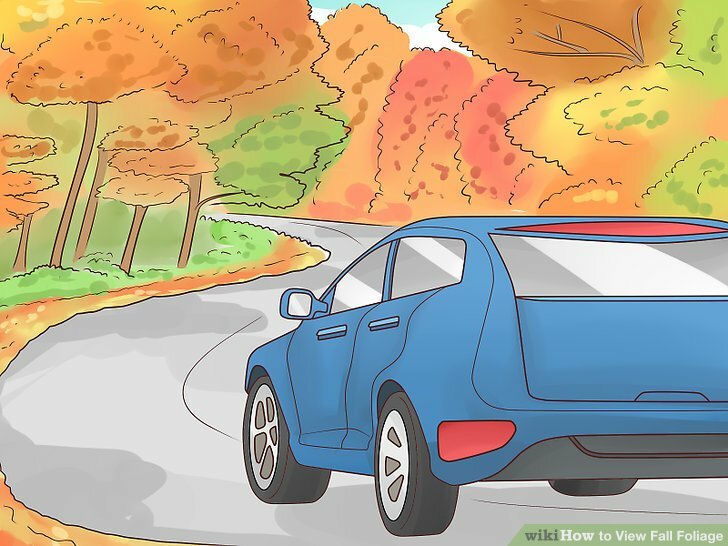 A great way to view the foliage is on a long, scenic drive. 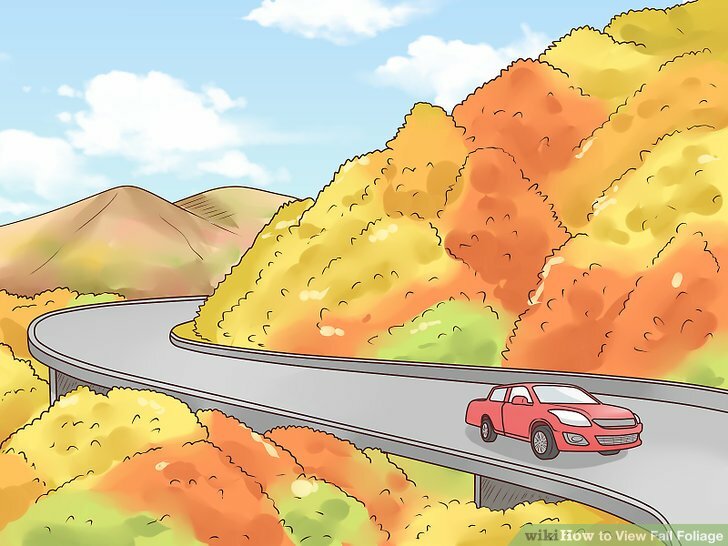 You can do this from within a state or national park, or simply cruise up a country road in the fall. Pop in your favorite CD and hit the road! Make sure your vehicle has enough gas before you start. Some parks and country roads have limited gas station availability. Take a hike through the forest for an up-close view. When you arrive at a park, take a look at their walking and hiking trail maps. Then, pick a trail based on your s**** set and interest. Most parks offer a wide variety of trails, including short strolls or intense climbs. Don’t forget your sneakers or hiking shoes! It is helpful to dress in layers, as it can get chilly if you are in the shade. 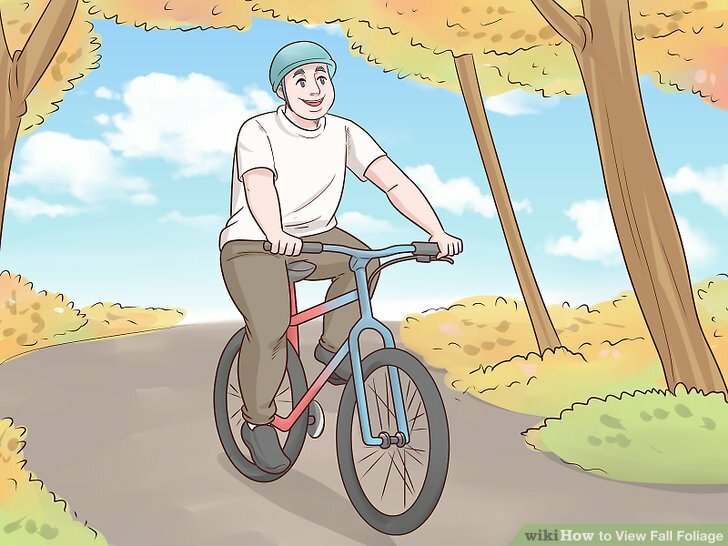 Ride your bike for a leisurely activity. A bike ride through the fall foliage is a great way to relax while viewing the colors. Ride your bike on a designated trail, or consider going mountain biking as well! Put on a helmet before you hop on your bike so you stay safe. It is helpful to wear stretchy, breathable clothing when riding a bike. That way, you are comfortable on your ride. Wear things like athletic shorts and performance tops. 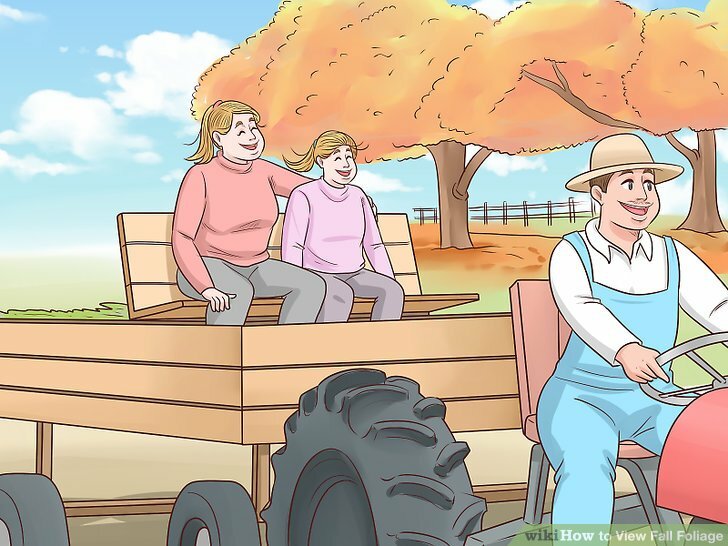 Most hayrides have a small fee to ride. Wear long sleeves when you go for your ride. The hay can make your skin itchy. Try going camping for an authentic fall experience. Fall camping is fabulous because the colors are prominent and the temperature is still comfortable. Search online for a campsite near you, and make a reservation online or over the phone. Then, pack your tent, sleeping bag, and warm clothing. Bring firewood, hot dogs, and s’mores for an authentic camping experience. 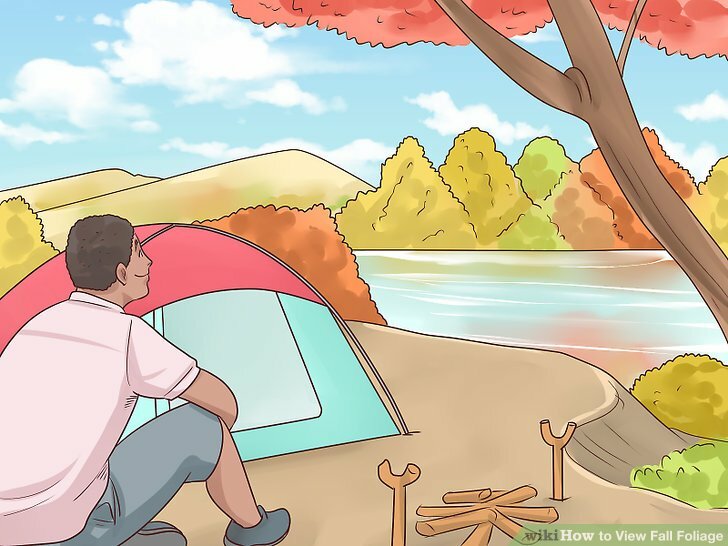 Camping is a great way to combine several fall activities. Bring your bikes, and go for a hike while you are there! If you’d like, you can print out the pictures from everywhere you travel. Then, place them in a photo album to display. If you are the driver, make sure you pull off the road before you take any pictures. Look at the foliage from binoculars to see trees up close. 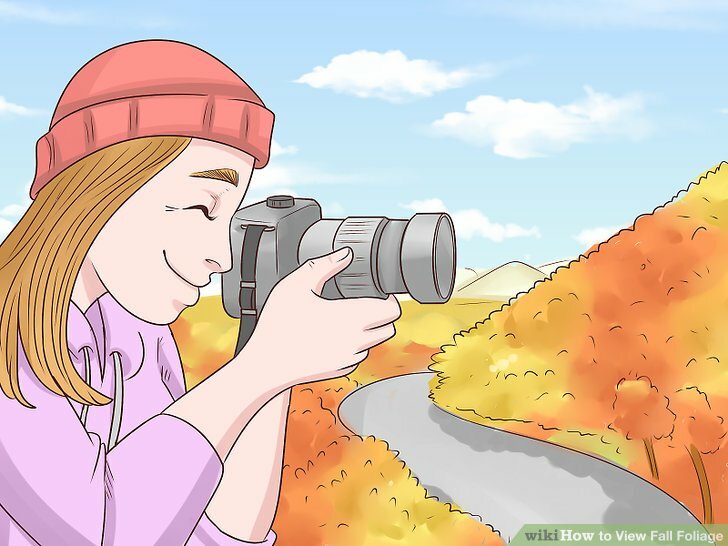 If you want to see the fall foliage from a different perspective, bring along a set of binoculars. Then, hold them up to your eyes and adjust the focus until you can clearly see the leaves. This way, you can see the colors from trees across the valley or check out the friendly woodpecker nearby. 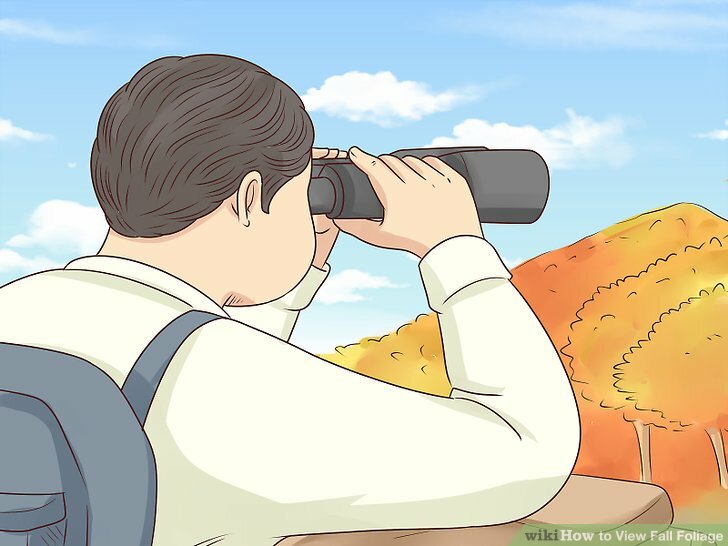 It is helpful to put the neck strap over your head before you hold up the binoculars. That way, you do not accidentally drop them. 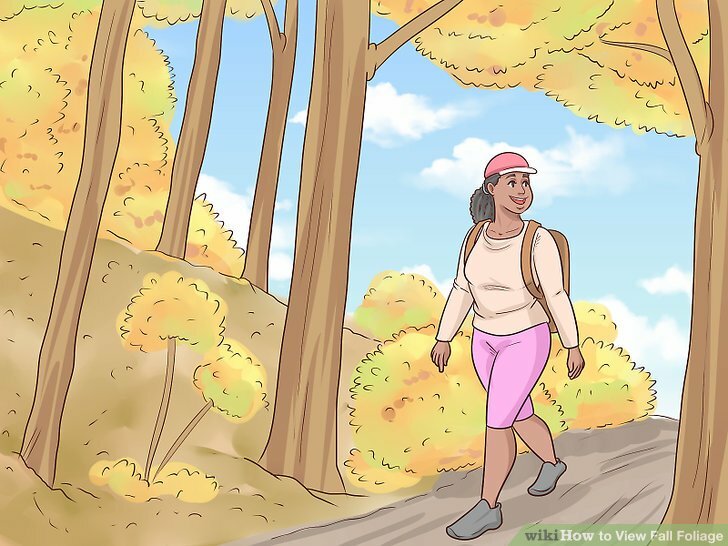 Dress in warm layers when viewing fall foliage. Bring a long-sleeved shirt, sweater, and/or jacket. That way, you’ll be prepared if the temperature changes. Pine, spruce, fir, hemlock and cedar trees do not change color, as they are evergreen trees.